I had my first official taste of wanderlust when I was 19. It was during a trip to Peru to visit my aunt and uncle, who were missionaries there at the time. It didn't take me long to realize how small I actually was in such a big world. When I returned home, I diligently mapped out all the places I'd love to see before my time on Earth is done. Since then, I have successfully been to more than half the destinations I first jotted down, despite the fact that many of the places I long to visit require airplane transportation and my strong aversion of flying. I recently returned from a two week holiday from England, if you want to call it as such. We went over for a family wedding, so I wouldn't necessarily classify that as a vacation as much as a visit, although the prices one has to pay to get there is almost that of a down payment on a mortgage, it should be called one. It's extortion. I've been to the UK quite a few times over the recent years as my husband was born and raised in a small town about thirty minutes northwest of Manchester. Lucky for us, much of his family still reside there, so there's always someone to stay with. Funny enough, of all the places I have had the opportunity to visit throughout in my life, England is one that has the strongest pull for me. I remember arriving back home on my first ever visit in 2003, crying the entire day, missing it terribly. Since that moment, I often find myself pining for a land I have only known for about twelve weeks of my entire life. Perhaps it's people I had met, perhaps it's the cracking humour, or perhaps it's the delicious sweet and savoury pies and chocolate I get to cram into my gob at any given moment without putting a dent in my wallet. However, I'm going to save my England adventures for another post as I have so much to say, but I wanted to bring your focus back to the actual travelling aspect. Did you ever sit and watch people while travelling? It's HILARIOUS. I say that, but sometimes it's not. However, I honestly believe this is where you'll find the true essence of a person. There were three twenty-something girls travelling to Britain with us - well, not with us with us. We seemed to have followed them (or they followed us) from drop off, to check-in to boarding. We all hit up Starbucks, as one usually does at the airport pre-flight and had the pleasure of their company at the table next to us. When they got up to leave to board, they left all their garbage on the table; wrappers, coffee cups, stirrers, sugar packets and screwed up paper with chewed up gum in them. The kicker? The garbage can was literally ten feet from them. Some poor member of the airport custodial team then had to clean up after them. It made me ask myself if that's what they did at home or just didn't bother, knowing someone would pick up their trash. Once on the flight, we had the utmost pleasure of having passengers in front of us that felt the need to recline their seats back the entire flight. If you are one of those passengers and before any knickers get twisted, please hear me out. I'm not saying NOT to recline, but don't get irate or incessantly grunt when one is travelling with children and one needs to push your seat up to get to one's bags on the floor or bump your seat several times when one needs to leave to use the facilities. If you're a six foot three human, my apologies as I can't imagine airline travelling is easy with legs as long as yours, but when you're five foot three and have the audacity to repeatedly turn around and give me the stink eye, prepare to meet my fire. The spaces are confined as is and that area becomes that much smaller when you recline. And then, there's those folks that that like to stare - and I mean STARE, especially when one is travelling with jet-lagged children and especially when eye contact has been established. Several times. Please know you are super fun, but do not make the situation easier for anyone. Bonus points when you shake your head. That is always so awesome to see. Unless you've walked a mile in my shoes, mind you own business. Heck, if you have, then shame on you. And doubly mind your own business. Then one arrives at one's destination. All is good until the seatbelt sign goes off. The pushing, the bumping, and the rushing that ensues to get to the baggage claim, only to wait twenty minutes for the luggage to come through is laughable. I never felt the need to drink as heavily as I did on that leg of the journey. Thankfully, once we were through customs and baggage claim, the nerves subsided. I picked up an apple and blackberry bar and welcomed myself to my third home. Apple and Blackberry is quite a popular flavour combination in England - and one of my favourite while visiting. In fact, some flavour combinations are weird, but yet so delicious they somehow work beautifully. Cheese and coleslaw sandwiches? SO good. Don't knock it until you try it. It will make your knees do just that. This dish is uber fantastic served with Crème Anglaise. I took the liberty of posting the recipe below in case you're feeling inspirationally British. 4 large Granny Smith apples, peeled, cored, and cut into bite-sizes. Please click here for recipe. Just be sure to omit the rum. Or not. Whatever. Preheat oven to 350ºF. In a 9 x 13 glass or ceramic baking dish, coat entire surface with butter. Set aside. In a separate mixing bowl, whisk together oats, brown sugar, cinnamon, and flour. Cut in butter and mix until large, coarse pieces form. In a large mixing bowl, coat apples in lemon juice. Add in blackberries, brown sugar, and cornstarch, and coat entire mixture well. Pour into prepared mixing bowl. Top with crumble mixture, ensuring most of the surface is coated. Remove from oven and allow to cool for 15 minutes as fruit will be very hot. Dish out and serve with crème Anglaise if you so desire. This dish is exceptional served with vanilla ice cream as well. This looks lovely! 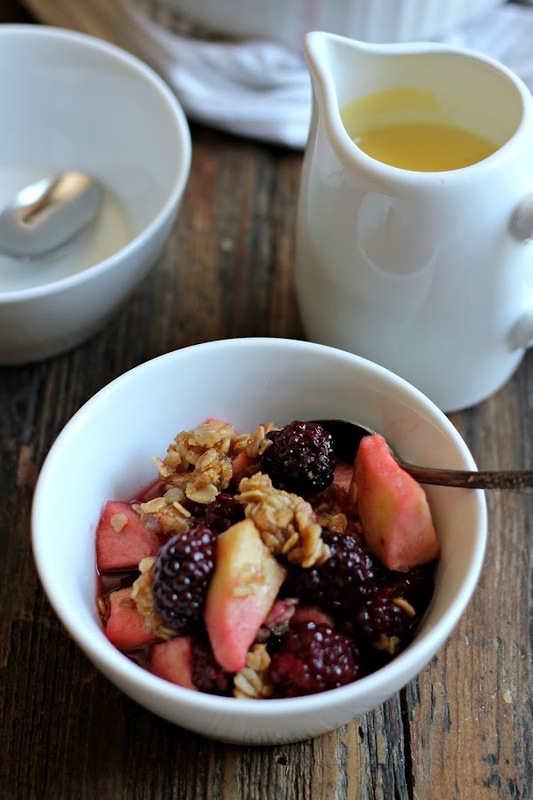 I've never paired apples and blackberries together- pinning! Hhaha I love people watching too when I am traveling. Especially at the airport where everyone just seems to be in a phase of moving. Also...this combination of blackberries and apple sound divine!! Hellz to the yeah on crème Anglaise!! 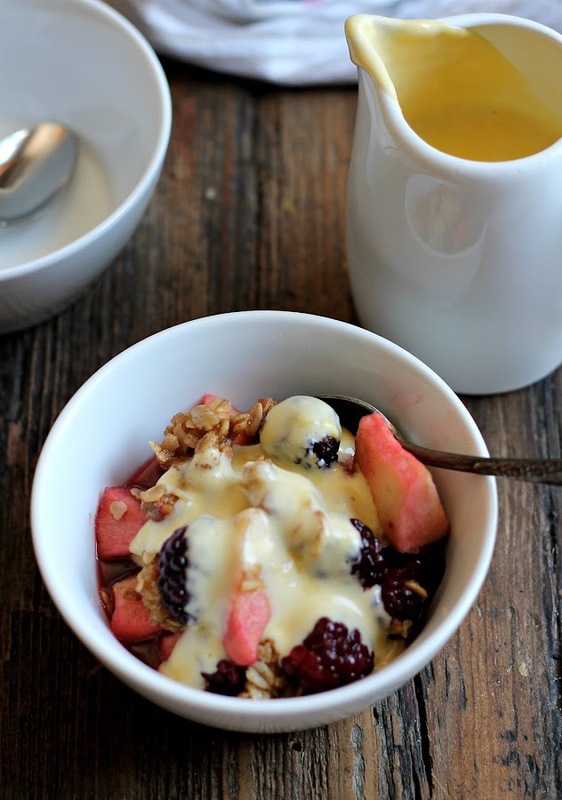 Great combination and perfect for breakfast! Pinning! 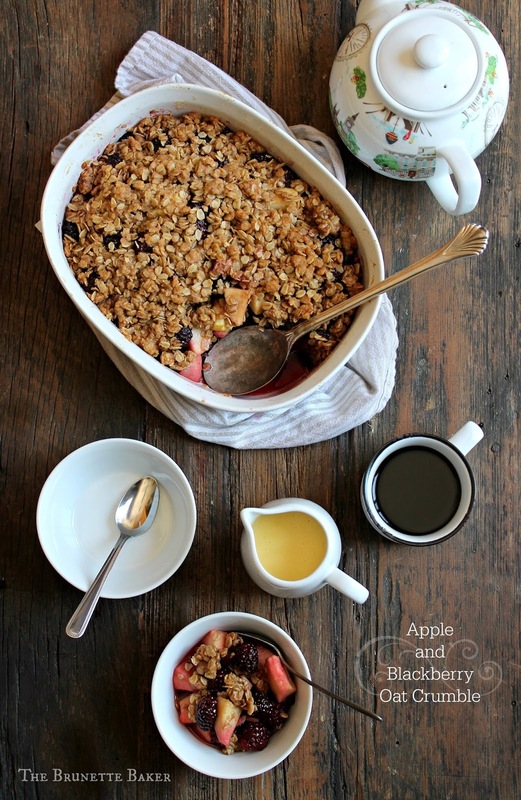 Apple and Blackberry is a combination I never would have thought to put together. It sounds incredible! On my must make list!